The Kerry Blue Terrier is an Irish breed used for hunting, retrieving and herding. The breed was developed by Irish commoners when the nobility began using Irish Wolfhounds to protect their grounds from poachers. The Kerry Blue Terrier could hunt undiscovered, in silence, and help put food on the tables. These dogs have a distinctive appearance with a soft, dense, and wavy coat. They shed very little, but still require regular grooming and should be brushed and trimmed regularly. 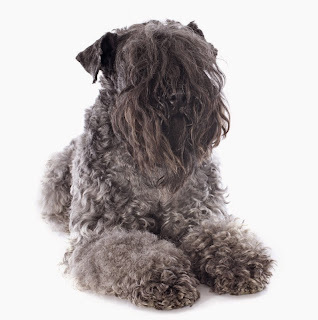 An adult Kerry Blue Terrier is gray, but the puppies are born black and the coat fades until they're around 18 months old. Kerry Blue Terriers are energetic and active dogs, and do best in active families. They love to dig and to chase things, and they require lots of exercise. Without both physical and mental stimulation they get bored and can become destructive. This breed was created to work, and they do best with a job to do. A typical Kerry loves people and is devoted to the family, but owners should be aware that the breed still has a strong hunting instinct.